A major weather event is currently unfolding across the islands of Honshu and Hokkaido Japan. Following Tropical Storm Etau which passed over Honshu earlier this week, a second weather system has brought more heavy rain, storms and coastal gales. The worst affected areas lie just north of Tokyo within the Ibaraki and Tochigi Prefectures. 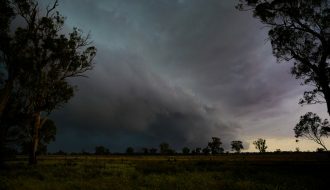 Media reports suggests as much as 550 mm of rain falling in isolated areas during Wednesday and Thursday with rainfall amounts reaching 50 mm per hour. September 6 - 0.79 inches. September 7 - 1.73 inches. September 8 - 2.56 inches. September 9 - 5.36 inches. September 10 - 2.14 inches. This tallies 12.58 inches or 319.5 mm for the period. Major flooding is currently occurring across the worst affected prefectures including the city of Joso which is north of Tokyo. In Tochigi Prefecture, flooding is occurring at Oyamashi. In Fukushima Prefecture, warnings have been issued for heavy rain and ground loosening (Appears to be related to mudslides) at Kawamata Machi and Tamura Shi. There are also flood alerts issued at Minamisoma Shi. Emergency Warnings are issued in Miyagi Prefecture for high waves and heavy rain in places such as Taiwacho Tobu. 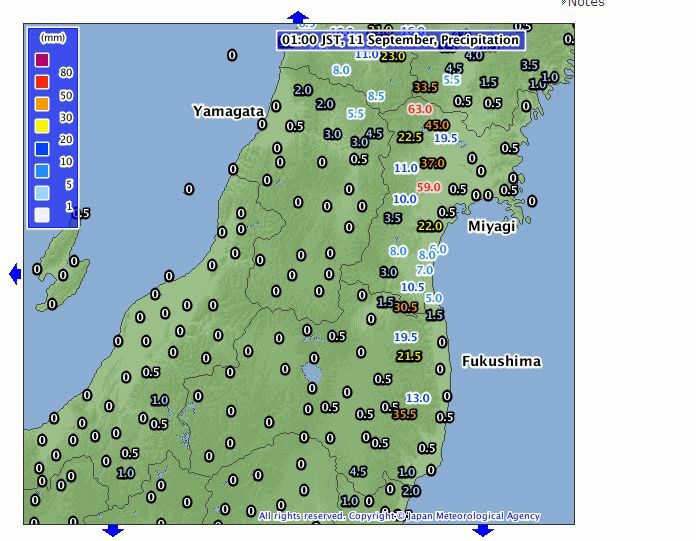 During the 10 September, some heavy rainfall occurred including 92.5 mm at Ryugasaki, 89.5 mm at Tochigi and 85 mm at Minori during a 4 hour period. At Ikari, up to 265 mm of rain occurred on the 10 September with as much as 60 mm per hour falling during the heaviest bursts of rain. The heaviest rainfalls have occurred across Ibaraki and Tochigi Prefectures. In Tochigi Prefecture, rainfall intensities reached 40 to 60 mm per hour during the period 7 pm to 12 midnight (9 September) although this was limited to more mountainous areas. 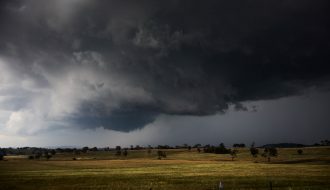 During the 10 September, similar rainfall intensities occurred for the period 12 midnight to 5 am although this was limited in extent to a small number of localities. 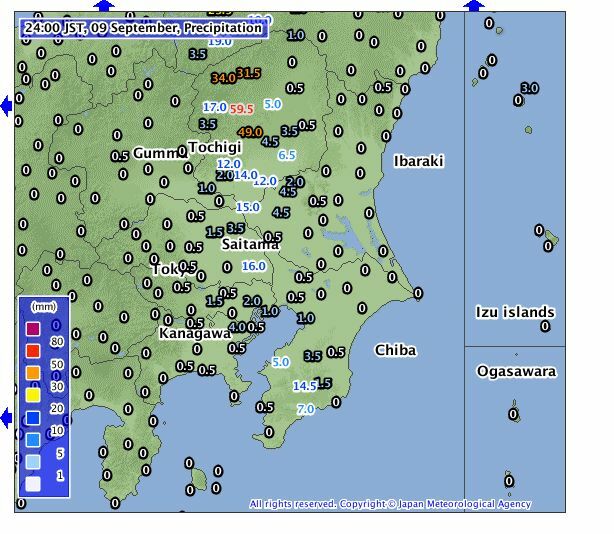 In Ibaraki Prefecture, up to 32 to 51 mm of rain was falling per hour at a few select locations and in Myagi Prefecture, up to 63 mm of rain fell at one location from 12 midnight to 1 am 11/9/2015. The Worldview Satellite photo of Japan dated 11 September is showing the weather system affecting northern Honshu Island and Hokkaido. In addition, the remnants of Typhoon Kilo now a deep low pressure cell remains off the coast which is also contributing to some of the rain occurring over north east Japan. There are two hourly rain plots provided generated at the Japan Meteorological Agency website showing the hourly rainfall. They are showing the heaviest hourly rainfalls for certain localities to highlight where the heaviest rainfall has been occurring. 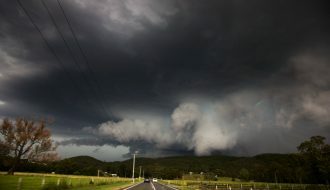 The weather event has led to numerous emergencies, flooding, evacuations, flood rescues, mudslides and property damage with significant impact around Joso City north of Tokyo. NASA (Worldview image with overlays acquired 11/9/15). Japan Meteorological Agency 9, 10 and 11 September - For rainfall data and plots. Accuweather - (Weather data for Tokyo) 6 to 11 September 2015.